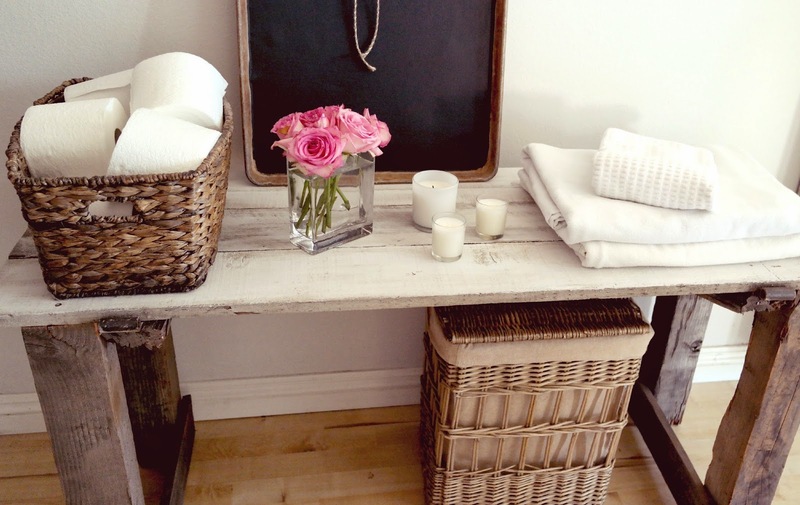 Salvage Dior: " Budget Style Prairie "
Lové the mood the prairie table adds to your space. It's rustic cuteness invites a closer look. Inspiring Kate, would love to see more of your guest cottage. An amazingly serene space. I can only dream of rescue wood pieces as these. Hope you are doing well, you are always in my prayers. So beautiful! I love the little chalkboard you made put of a cake pan....very clever!!! Have a great week!!! Love the rustic door table with it's rusty hinges, the pop of pink flowers is precious and how cute is the recreated black board. You always inspire. Kate I also like many of the comments left look forward to seeing more of your guest cottage. Lovely Kate...happy new week love from me...x ! I have missed seeing you...not that I am doing much here in blog land but just sayin good to see you :). I am also not getting your feed from FB I need to see why?? anyway I love your sweet lil vignette outside your bath..its always lovely what you do my friend. Looks so pretty Kate! We are making over our den and the desk is the next step. My handy husband is going to give our existing desk a new top with some wonderful old reclaimed wood. I have been showing him some of your projects for inspiration. Thanks and wish us luck! This is so very restful and lovely, Kate...and will make any guest who stays there feel very special! Kate, I just LOVE that you left the hinges for added character. 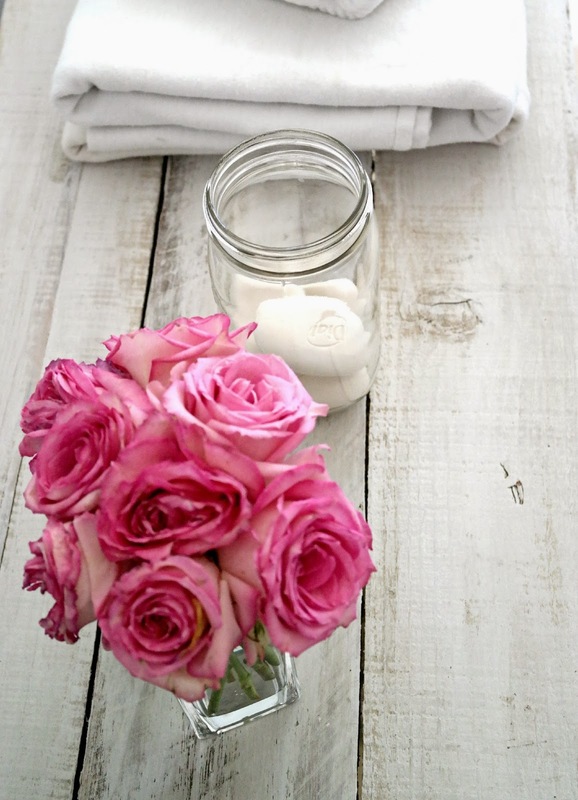 Such a pretty table and lovely vignette! So simple and pretty. I love the vintage charm. Would love for you to share at Fridays Unfolded! Kate I love the way you take things so chippy and worn and transform them in pure beauty!! 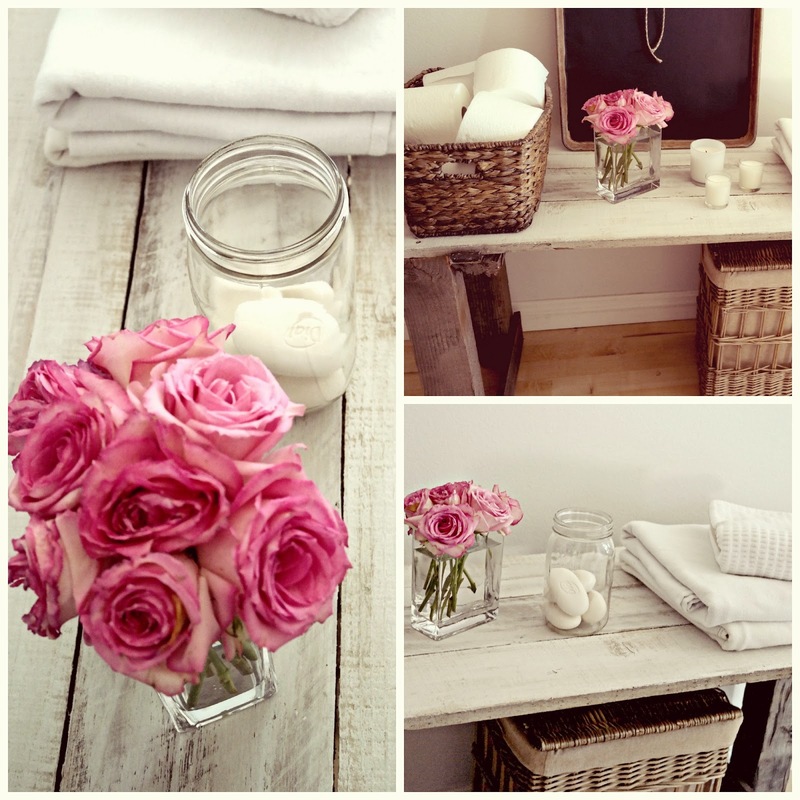 You create a vignette full of charm and freshness. Always lovely over here! I so love the weathered woods in it's original patina.I love your thoughtful decor style.Hugs !!! Oh to be a guest would be the best. lol! I mean it ever so truly though. You create wonderful welcoming things dear Kate! 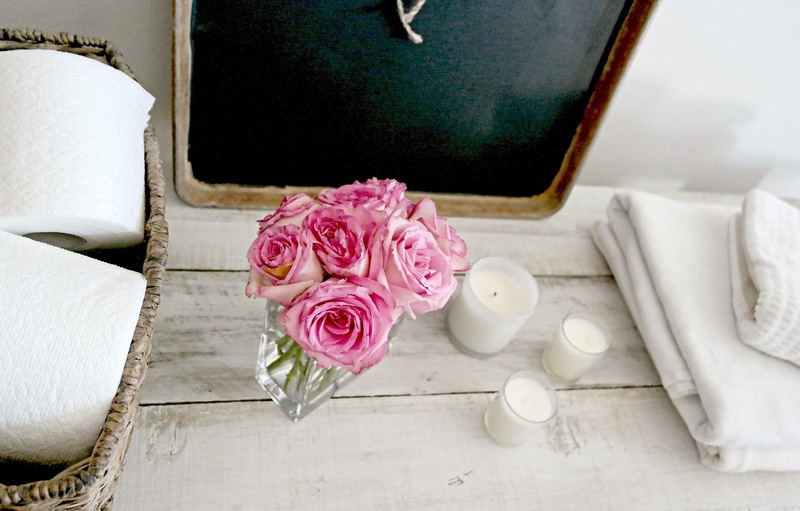 Love the table and the sweet chalkboard on a baking pan! So happy to have you share it with SYC. what a wonderful setting, oh those roses, just the perfect pop of color! so very welcome, love the table made from old wood, very charming! 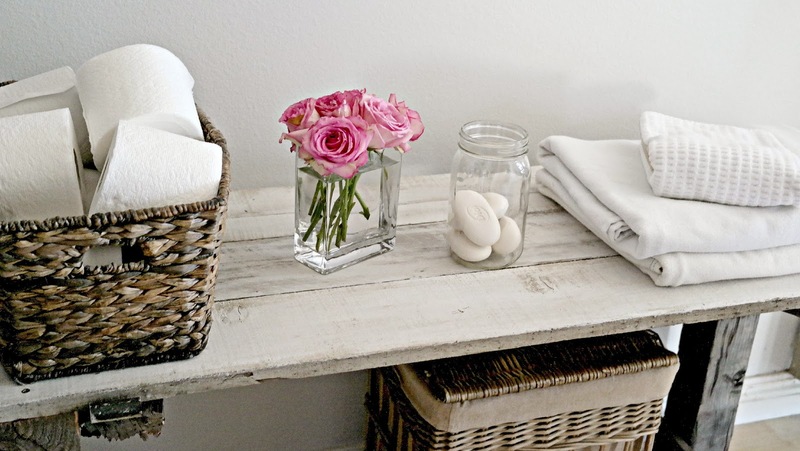 I love the table made from the old wood gate… The beautiful roses give a great pop of color! 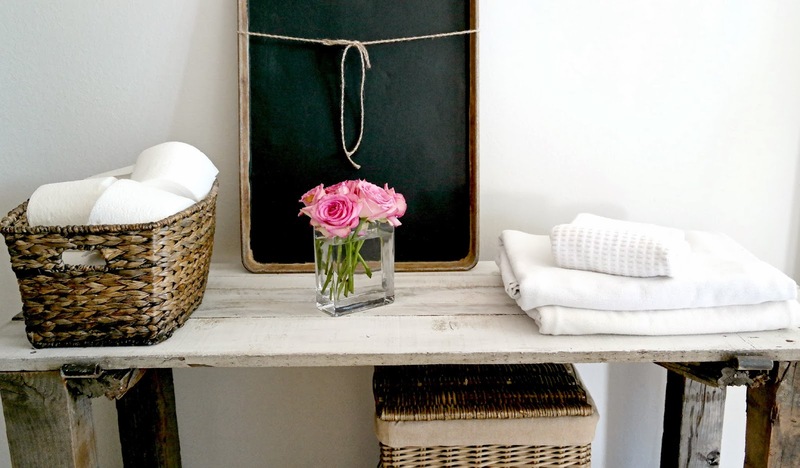 A Beautiful Repurposing Project, just bought Rachel Ashwell's Couture Prairie book and was drawn to the Rustic but Romantic Simplicity of the Styling... this is reminiscent of that Style, so Relaxing and Welcoming! So miss you my dearest! Beauty, grace, and love your way. Kate, I so enjoyed looking at this again! Love your style and attention to detail. You know I think about you often and worry when you have been absent from blogland! In my prayers! !